Life seemed full of possibilities for Mahmood Ahmad and his bride Farah Munir when they married in front of family and friends. But a guest pictured standing behind the couple was to rob them of their future together - and Mr Ahmad of his life. The groom's brother-in-law, Mohammed Riaz, was smiling that day in March 2008, but it was a smile that masked a sinister, obsessive and sadistic streak. When his wife, Mr Ahmad's younger sister, Nahid, walked out on him later that year because of his violence and abuse towards her, he began a terror campaign against her family to find her. He led a gang - including his brother - that kidnapped, tortured and he then murdered Mr Ahmad in a quest to learn where Nahid was in hiding. She had initially gone to Blackburn, Lancashire, but Riaz found her and she was forced to move to Burnley and change her name, telling only a few family members her whereabouts. 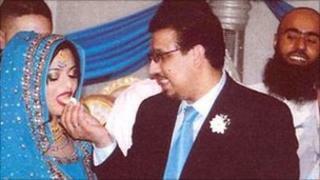 Her sister, Razia Ahmad, was burgled in Nottingham in 2009 by Riaz, who was looking for information to lead him to Nahid. He left a bath running to flood her home and in a phone message later told her: "That was only water, next time you are going to burn." In March 2010, Mr Ahmad was on his way home from work from a kebab shop when he was captured on his driveway in Watford, Hertfordshire. He was bundled into a car driven by Riaz and taken to a flat where Riaz's sister, Sabra Sultana, lived with her boyfriend, Amirzada Hussain, in Ilford, east London. Mr Ahmad was tortured in an attempt to make him tell Riaz where Nahid could be found, but he refused to divulge any details to his captors. His screams, said by the prosecution to be full of fear or terror, had been heard by people in the flats but no-one alerted the police. Soon after the murder, the Honda car used to ferry Mr Ahmad from Watford to east London had been broken up, and Sultana's bathroom suite was ripped out and a sofa and carpets dumped. But Riaz and the others were caught after their victim's thumb dropped out of the sky, possibly from a bird's beak, and into an office car park. His family reported him missing and it was on 10 March, 2010, that a CCTV camera in Ilford, Essex - about a mile from Sultana's flat - captured the moment the severed thumb fell to the ground. A cleaner standing outside the offices smoking a cigarette thought at first it was a discarded piece of chicken thrown from an upstairs window. Landfill sites near the spot where the thumb landed were searched for more remains, but without success. Officers scoured local dumps and even studied flight paths of birds in an effort to work out where the thumb could have come from. Forensic teams who searched Sultana's stripped-down flat found traces of blood, which matched the DNA profile for Mr Ahmad. The people behind his torture and killing were brought to justice, but Mr Ahmad's remains have never been found. Police said they were determined to track them down so his family can give him a dignified burial.